Ramblings of an Impatient Artist: OMG! I thought I'd share this bright new image by Sassy Studio Designs with you today - TinkerSassy! I think Tink is pretty sassy already - but now she's even more so! Apparently, I have a fixation with green here the last couple of projects. She's a digi image of course, so I traced her wings onto some acetate, cut them out and Stickled them. I like the more transparent look on fairy wings. The print paper is Bo Bunny and the "OMG" sentiment is a Studio G stamp. Sassy Studio Designs is sponsoring a couple of great challenges, both are fantasy themed. One is at Glitter N Sparkle and the other is Hobbycutz. Check them out and create your own fantasy themed project! Jodi, just stunning! Love those wings. Amazing colors, I love all the green! Thanks for joining us at ATSM this week! Stunning, such vibrant greens, fabulous image and colouring, the wings are beautiful! This is simply gorgeous - your colouring is perfect! 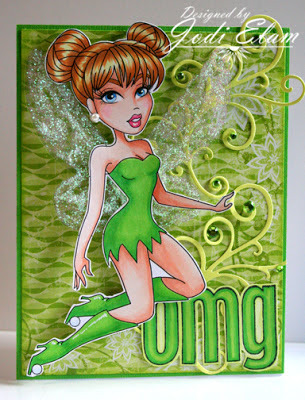 I love how Tink seems to be flying right off the card - great 3D effect! Thank you so much for joining us at Glitter n Sparkle for the Fantasy/Fairytale challenge. Such a pretty piece of work! This is great, very brave going all green and making it work so well. Thanks for sharing with us at CMM.